The Gwinnett Braves have awarded their $1,000 grant for the month of July to the Gwinnett County Veterans Memorial Museum, announced on Monday, October 28. The “Red, White and Blue” themed grant is aimed at assisting organizations that support the military or military families. Founded in 1988, the Gwinnett County Veterans Memorial Museum exhibits the memorabilia of the men and women who have served and are serving in the Armed Forces of the United States of America. The museum remains a lasting memorial that is a first-class area attraction of historical and educational significance for the city of Lawrenceville, Gwinnett County and surrounding counties. The museum features uniforms, pictures, medals, artillery projectiles, firearms, newspaper clippings and other artifacts from the Revolutionary War, War Between the States, World War I, World War II and other conflicts in United States history. There is also a section dedicated to honor the service of women in the military, with uniforms of the various branches of the Armed Forces in which they served. The grant awarded by the Gwinnett Braves will help the museum maintain existing exhibits and artifacts. Funds will also be applied to purchasing new display cases and picture frames, as well as acquiring new artifacts. “The generous grant from the Gwinnett Braves will allow the museum to expand the displays through the addition of at least two more large display cases in two of our rooms, thus enhancing the exhibits and making it more appealing to our visitors” said Chief Master Sgt. Paul J. Pickard, the Director and Treasurer of the Gwinnett County Veterans Memorial Museum. About the Gwinnett County Veterans Memorial Museum: Located at the Gwinnett Historic Courthouse in Lawrenceville, GA, the Gwinnett County Veterans Memorial Museum is run by the Museum Committee, a group of 13 veteran volunteers who meet every Wednesday. To find out how you can volunteer your time and money to the museum, visit www.americanlegionpost232.org and click the Gwinnett Veterans Museum link, or call 770-921-1326. The original story appeared on the Gwinnett Braves’ website and can be viewed by clicking here. 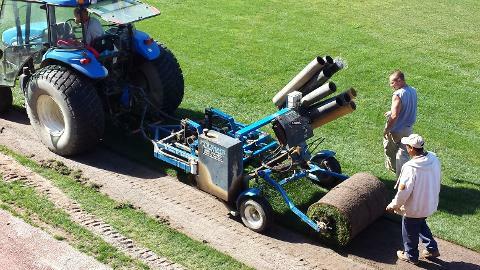 New sod will soon be installed on the field at Whitaker Bank Ballpark, home of the Lexington Legends, and the old sod will find a new home – in fact, it likely will find several new homes. Part of the sod that is being taken up at the ballpark has been donated to Habitat for Humanity, where it will be available for purchase at Habitat’s ReStore, 451 Southland Drive. The ReStore is a home improvement resale store that sells donated new and gently used furniture, home accessories, building supplies and appliances. Proceeds from sales at the Re-Store benefit Lexington Habitat for Humanity’s mission to build affordable homes for Lexington families. “We were excited to get the call asking if we could accept some of this sod,” said Jim Kreiner, director of the ReStore, a home improvement resale store that sells donated new and gently used furniture, home accessories, building supplies and appliances. He said since current Habitat homes were not quite ready for sod to be laid, the donated sod would be made available for sale at the Re-Store. This article originally appeared on the Legends’ website. The Community Partnership Award is presented in conjunction with Parent Network’s annual Harvest Honors Fundraiser. Funds raised are utilized to educate families of children with disabilities about services and supports in the community. As part of Harvest Honors we will be hosting a Silent Auction and Basket Raffle along with the Red Carpet premier of “Always October”. This ground-breaking play was co-written by Western New Yorkers Mary McLaughlin, Wanda Wilson and Beth Geyer, directed by Victoria Pérez with a cast comprised of both individuals with and without disabilities, as well as parents of those with disabilities. The Harvest Honors fundraiser is on October 17th and will begin at 5:30pm with a cocktail reception, a silent auction/basket raffle and award ceremony. The main event at Harvest Honors will be the opening of “Always October”. The play will then continue its run until Sunday October 20th. All evening performances are at 7:30pm with a Sunday matinee at 2pm. The fundraiser/play will take place at Alleyway Theatre-1 Curtain Up Alleyway in the heart of Buffalo’s downtown theater district. For ticket information please call Peg Kovach at 332-4170 or visit our website at http://www.parentnetworkwny.org/harvest-honors. This article originally appeared on the Bisons’ website. To see it, click here. Gwinnett Braves Award September Grant to For My Sisters, Inc. The Gwinnett Braves have awarded their $1,000 grant for the month of September to For My Sisters, Inc. The “All About Children” themed grant is aimed at assisting organizations that benefit children. For My Sisters, Inc. helps single-mom families acquire back to school needs, including school supplies and backpacks, shoes, clothing, and personal care items such as toothpaste and deodorant. According to the organization, 40 percent of single mom families are below the poverty level. For My Sisters, Inc. endeavors to help provide in many areas of child rearing so the children of these families may become healthy, productive adults. The grant awarded by the Gwinnett Braves will help the organization in purchasing tennis shoes and clothing required for Georgia schools’ Physical Education programs. This will ease the financial strain on numerous single-mom families, especially those with more than one child. “Because of this wonderful, generous grant from the Gwinnett Braves, For My Sisters will be able to provide new shoes and other necessities for a successful school year for many children,” said Kari Price, Executive Director of For My Sisters, Inc. The Gwinnett Braves have awarded their $1,000 grant for the month of August to Family Connection and Communities in Schools of Barrow County. The “Back to School” themed grant is aimed at benefiting organizations that support education or after-school mentoring. Family Connection and Communities in Schools of Barrow County strives to improve the quality of life for children and families in Barrow County by fostering collaboration at the local and state levels to ultimately bring into focus their vision for all kids to be healthy, ready to start school and succeed when they get there, and for their families to be stable and self-sufficient. The grant awarded by the Gwinnett Braves will help fund the organization’s “Back to School Bash,” a program that will distribute over 400 book bags, pens, pencils and notebooks to school-aged children in Barrow County. “With programs that focus on youth peer-to-peer leadership, healthy decision making and breaking down barriers that keep students from coming to school and learning, we feel we are making a difference in our future leaders,” said Meg Loggins, Executive Director of Family Connection and Communities in Schools of Barrow County. The Clearwater Threshers are pleased to announce that their fans helped raise nearly $6,000 on August 17 to benefit two organizations for the support of U.S. military veterans. The Threshers held 2013’s Military Night on August 17 in their Saturday night game against the Dunedin Blue Jays at Bright House Field, and their fans came out in force to support the troops. 4,183 fans turned out to raise $5,807.50, which was split between Sand Soldiers of America and the Haley House Fund. Each group received $2,903.75 in a ceremony on the field on the season’s final day. 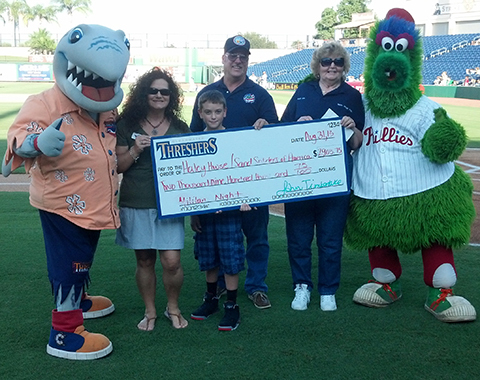 The Threshers front office would like to thank all our fans who helped us to raise money for such a tremendous cause. We look forward to many future charitable partnerships. This article originally appeared on the Clearwater Thresher’s website. Click here to view the original story.